To Tibetans and other Himalayan people, the dZi is a "precious jewel of supernatural origin" with great power to protect its wearer from disaster. The Tibetan people believe dZi beads are spiritual stones fallen from Heaven which bring good karma to those who own them. The ancient Dzi absorbs cosmic energy from the universe. Tibetans generally believe that dZi beads are of divine origin and therefore not created by human hands. Some say they are dropped by the Gods to benefit those who have the good fortune to find them. Since they are believed to have a divine source, they are considered to be a very precious and powerful amulet. Beads can often be seen in Tibetan temples adorning the most revered statues and sacred relics. They are thought to bring good fortune, ward off evil, and protect the wearer from physical harm and illness. 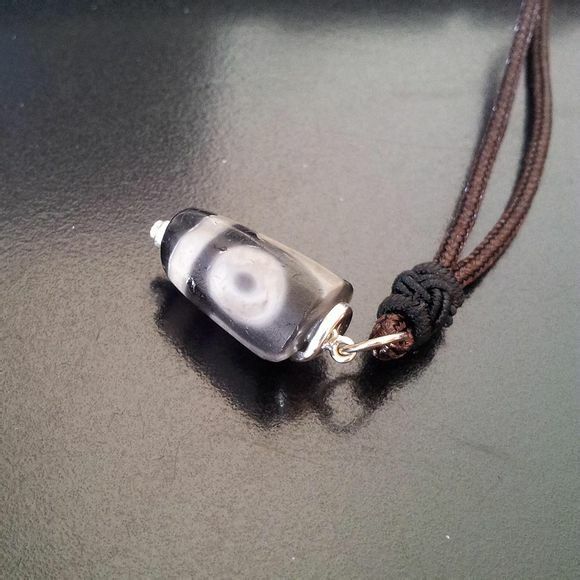 It has even been claimed by Tibetan refugees, that they protect the wearer from knife and bullet attacks! Dzi (pronounced Zee) is a Tibetan word used to describe a patterned, usually agate, of mainly oblong, round, cylindrical or tabular shape pierced lengthwise called Heaven's Bead (tian zhu) in Chinese. The meaning of the Tibetan word "Dzi" translates to "shine, brightness, clearness, splendour". The beads originate in the Tibetan cultural sphere and can command high prices and are difficult to come by. It’s said to possess mysterious powers and bring good fortune to the wearer. Ancient and pure dZi beads of Tibet are extremely precious and rare. No matter how many or how few eyes they bear, all dZi beads possess the mystic power of bringing luck, warding off evil, stabilizing blood pressure, guarding against apoplexy and enhancing body strength. Owners and wearers of these beads are blessed with unexpected credit, luck and perfection. They are found primarily in Tibet, but also in neighboring Bhutan, Ladakh and Sikkim. Shepherds and farmers pick them up in the grasslands or while cultivating fields. Because dZi are found in the earth, Tibetans cannot conceive of them as man-made. 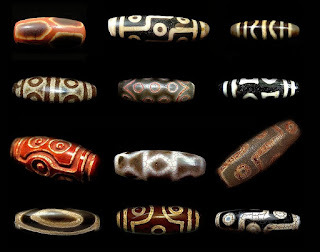 Since knowledge of the bead is derived from oral traditions, few beads have provoked more controversy concerning their source, method of manufacture and even precise definition. This all contributes to making them the most sought after and collectable beads on earth. The most prized pure dZi, are generally beads with eyes or unusual decorations. A pure dZi may or may not have eyes. It can be opaque or partially translucent (In Tibet, translucent beads are usually valued lower). The most sought after base colour is an opaque dark brown to black. "Pure" dzi beads, in the traditional Tibetan system for evaluating dzi, are regarded as the most valuable and desirable variety. 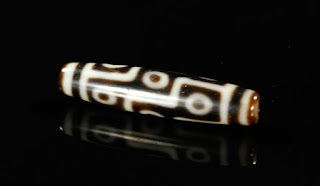 Etched agate beads not considered pure are called “Chung Dzi”, or "secondary, less important dzi". Lastly, “etched carnelian” is not recognized by the Tibetan. Chung dZi has such a huge variety of shapes, sizes and designs, from plain natural carnelian or striped agate, to huge, beads with many etched lines and patterns, that they would be impossible to value. 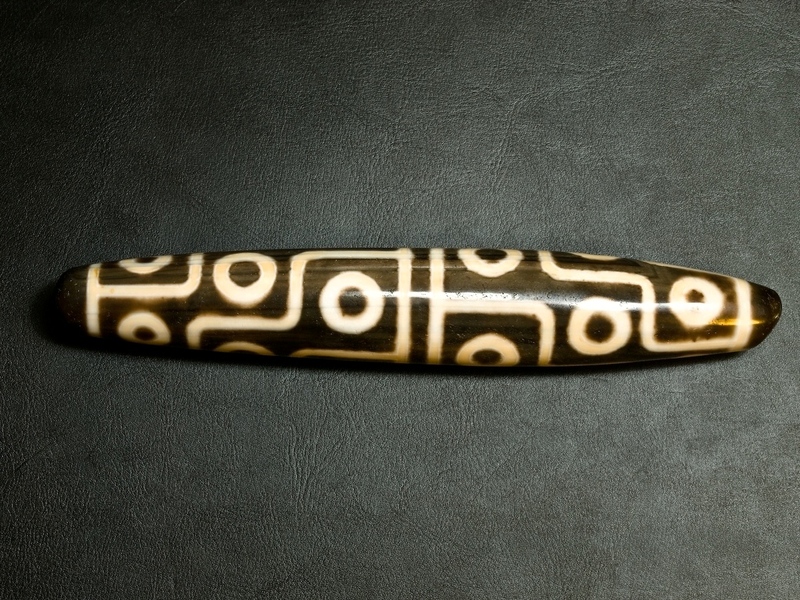 A brown and milky white body color Tibetan dzi. The round brown dot surrounded by white circle is the eye of dzi. 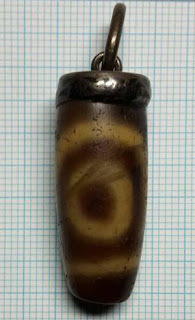 There are five “eyes” on this bead (called dzi mig inga pa in Tibetan language); three can be seen clearly from this photo, the other two are at the rear part of the dzi. 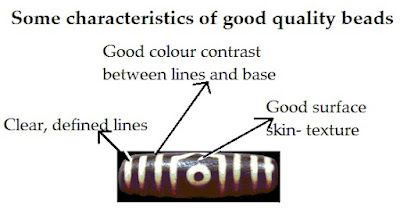 The reader could also easily detect the weathering mark on the surface of the dzi bead. 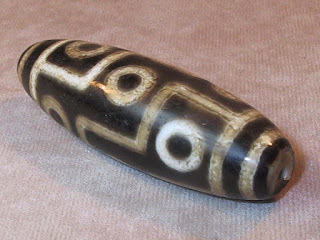 This authentic pure five-eyed dzi is a high value old bead. 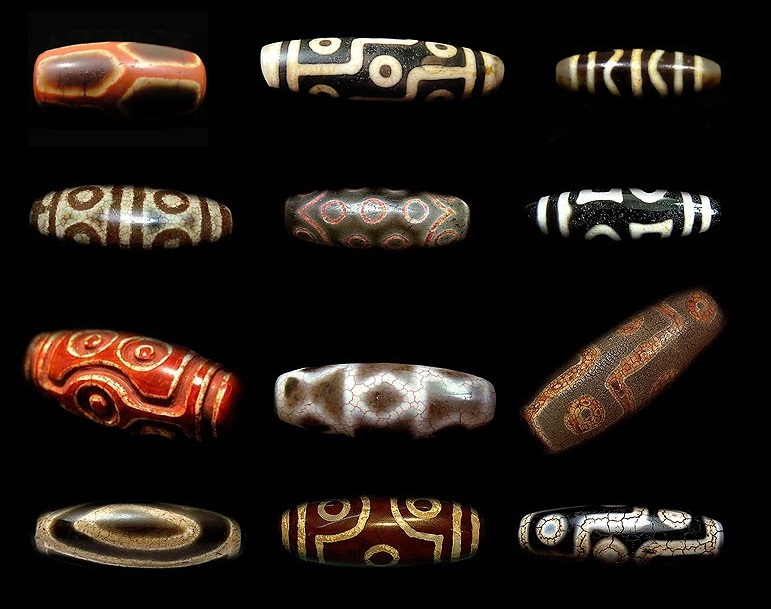 The dzi bead is one of the most mysterious of all the beads known to human being today. Numerous attempts to trace back to their source yield fruitlessly although many dzi beads have been passed down from generations to generations. They exist seemingly in isolation, as if snapped from a chain, with no links to their past. It is unclear to many bead scholars the exact origin of dzi bead, why, when and how it was manufactured. The fact is these tiny stone beads patterned with mystical eyes are one of the most treasured beads in the world today. The Tibetans believe the dzi beads are the precious jewels with supernatural origin. There are many myths and legends in Tibet describing the origin of the bead. Among the many myths and legends that follow the dzi, the main belief is that the gods created them. 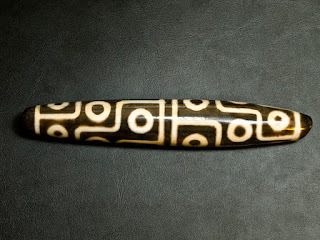 The Tibetan theorized divine origin rendered the dzi to be precious and powerful talismans. Most Tibetans will not let go of it because this may cause bad luck to them. In addition, the rarity of the bead makes them as valuable as diamonds in Tibet. Most Tibetans believe that the dzi were once insects that lived in a kind of nest call “dzi tshang” in Tibet. When the insects were unearthed they will continue to move for a while and eventually become petrified in the form of dzi that exist today. There are stories say that the dzi were once insects but became petrified by the touch of human hand, or by the people with good karma, or by woman’s shirt. 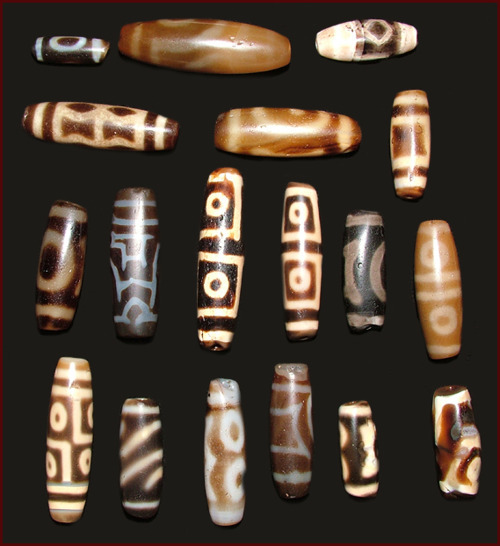 Patterns on Dzi beads reflect Brahmanic teaching of ancient India, and are symbolic of the "wulunfajieta" beliefs. Each pattern bears a different meaning. Yet they are somewhat similar to the Taoist beliefs of Yin & Yang and the 5 elements as the fundamentals of life. Hence from the geomancy point of view, Dzi beads can improve one's luck and help to ease problems and worries. The five-element system views the human body as a microcosm of the universe with the tides of energy and emotions waxing and waning. These energies and emotions are stored in the visceral organs and move through specific pathways or meridians in the body in a regular and cyclical fashion. When these energies or emotions become blocked, or deficient or excessive through stress, trauma or disease, the five-element practitioner may use carefully controlled pressure on certain meridian points to help move the energy or emotions. This restores the natural cycle of energy and emotional movement, thus helping the person’s natural ability to heal. There are five elements that operate to provide balance and structure to not only the world, but also our lives and bodies. These five elements are water, fire, metal, earth and wood. The philosophy behind the five elements and their use for healing purposes is that everything in the world is made up of a combination of them. Due to this interconnectivity, each and everything has certain characteristics that are linked to the elements. We can look at the body and how it ties into the elements and the way it works. The liver and the gall bladder are linked to the wood element, small intestines and the heart are connected to the fire element, spleen and the stomach to the earth, lungs and large intestine to metal and finally kidneys and bladder to the water element. There is a Question which often people ask me. What to do if the Dzi Bead is Broken? There is several websites that explain what to do when dzi bead is broken. Broken dzi bead: This can be any bead that has broken off a chunk of itself. Some small tiny little chips around the thread holes can make it a tonic bead. In the case of Fire Burial beads they may have a small divot or chip anywhere on the bead. These are sometimes caused during the time the bead is in the fire. These pieces are released from the body of the bead due to heating and cooling that the bead goes through. These divots/chips will always be used for medicine or potions. 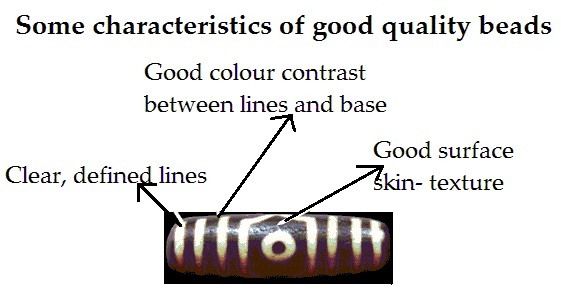 To tell whether the bead qualifies to be considered broken, check to see if any portion of the bead’s symbols, lines, eyes, etc. have been broken into. If the bead’s symbols have been broken it is considered broken. If the symbols are in tact it is considered still viable. Another way to continue to wear the broken dzi beads is to attach precious metal to the dzi bead, just like the photos below. When a large portion of the bead breaks off the bead is seen as being finished with its work. It is time for the bead to be retired and allowed to rest as its reward for all of the work it has done. Some times the beads energy is spent. Some times the bead has collected so much negativity that it causes it to break or burst in order to relieve the negativity. When one of your beads break, bury it some where in or around your home. You can bury it in a house plant, or outside near a tree or you can create a sacred place for it to be buried. You may also find a nice place in nature to bury the bead or sail it into the river with a grateful feeling of what it has done for you. After all, the earth is where it is originated from. You may replace it with another similar dzi bead on your current situation. Anyhow The bead will continue indefinitely to radiate energy even if it will no longer take an active role in the owner’s life. 1) The Dzi bead should be worn on the body (hand, neck, leg, waist etc) as it needs to sense and blend with the natural energy field around our body. 2) The Dzi bead should be removed when bathing to prevent any contact with water, causing the string that holds the Dzi bead to break easily. 3) In the event of committing acts that might be disrespectful to the Dzi bead, kindly remove the Dzi bead temporarily. 4) Please take extra care when changing or washing clothes, or even doing chores that might accidentally dropped or knocked against objects and break the Dzi bead. 5) In the event where the Dzi bead breaks, replace the Dzi bead as soon as possible. 6) Sincere in believing the Dzi bead to work for you will reward you with wisdom and good fortune. 7) It is advisable to place the Dzi bead on the altar when not wearing to prevent any damage to it. In addition, the god on the altar can bestowed luck to the Dzi bead too. As I love the crystal and so I keep wonderful collection of crystal related books. I always keep reading and surfing on internet/ google also, so I have gather many information and also done practical experience about the crystal energy. 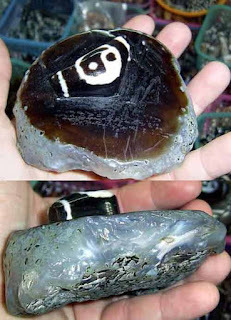 I have enjoyed the benefit of crystal healing, but any information on uses and properties included with this listing (which has been gathered from reputable sources, such as Judy Hall and Michael Gienger's books on crystal healing etc also from google surfing) do not, under any circumstances, constitute a claim on behalf of the Seller. The information given is not intended to act as a substitute for medical treatment, nor will any guarantees be given for any spiritual or metaphysical qualities.